Thank you very much for visiting my offer, I am an email marketer and lead generation specialist. Are you interested to Promote/Expand your Business to more Consumers or Do you need to get in touch with more People to reach your Products/Service??? I am always available. Please feel free to contact me anytime if you have any kind of query. Super happy with the work received! I will repeat! Maruf was patient and profesional. He providing with an accurate list of contacts. Thank you! Great work done by Maruf. Showed me a sample before starting work, that says a lot. I will use him again in the future. 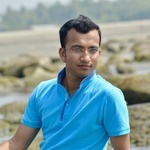 I am Maruf Hossain, an Email Marketer. I have 4 year experience on Email Marketing Strategy including Lead Generation, Web Research, Design Newsletter and Handle Campaign etc. I am...Read moreI am Maruf Hossain, an Email Marketer. I have 4 year experience on Email Marketing Strategy including Lead Generation, Web Research, Design Newsletter and Handle Campaign etc. I am very much punctual, creative about my work and believe on hard work to progress my client's business. I am diligent worker and passionate about my work and responsibility. I believe, I would be a beneficial addition of your company.